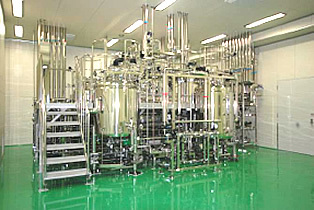 Pharmaceuticals｜Biopharmaceuticals (CDMO business)｜Pharmaceutical manufacturing｜Contract services｜API Co., Ltd.
We can accommodate vial volumes ranging from 2 to 15 mL. 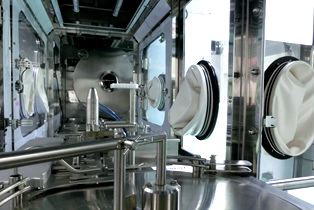 By using traceable pipes to move biopharmaceuticals, which often must be kept refrigerated, from formulation equipment to filling equipment, we are able to control the temperature of drug solutions from 5°C to 15°C from the tank to the filling machine. In addition, we use two-stage sterile filtration, enabling us to formulate volumes of up to 900 L.
We have a C/SIP-compliant spare dissolution tank (600 L) whose temperature can be regulated (from 5°C to 15°C). Capabilities include formulation of sterile drug solutions, handling of sterile active ingredients, and sterile sampling. 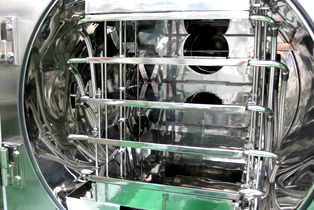 Post-filter tanks and filling machine header tanks are equipped with agitators, allowing filling of suspensions. Alkaline-based washing is possible for some CIPs. We can accommodate formulation using fixed equipment as well as formulation using single-use bags. 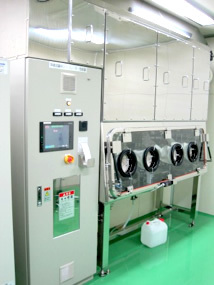 The cooled portion of our vial dry sterilization system has been fitted with a heat sterilization system. Our high-speed filling line can operate at up to 350 vials per minute (when using vials with a diameter of 16 mm). We use an in-process control (IPC) system to eliminate human error. We use a time pressure system to increase washing performance. In addition, we have installed a temperature correction system to increase filling precision. We can connect and fill drug solutions in low-volume, single-use bags (2 to 5 L), for example investigational new drugs. 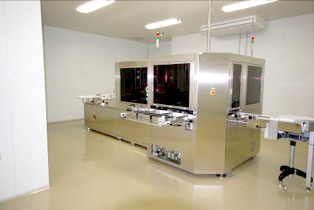 Our seamer is installed under a laminar flow inside a sterile room. Inline automatic testing equipment enables us to carry out appearance and content testing on filling lines simultaneously. 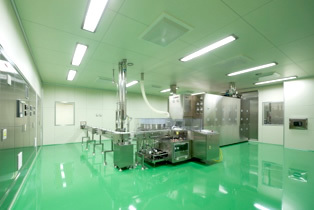 We have installed a closed RABS in our sterile room, enabling production in an advanced, sterile environment. 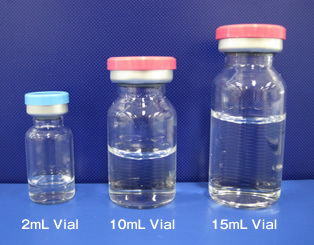 We package vial products in individual boxes. At the same time, when a contract allows sorting by automatic testing equipment or acceptance testing of intermediate products, we can also offer contract packaging of imported products. We offer the full sequence of processes, from vial labeling to packaging in individual boxes, printing, and packing of boxes into cartons. We can package up to 300 individual boxes per minute. We use an in-house system of identification codes for materials to prevent inadvertent mixing of different product types. We have inline capability for printing RSS codes on individual boxes. 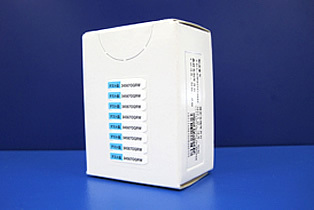 We can assign special certification information for vaccines and affix chart stickers. The packaging environment is kept at 20°C or below. 33 mm (height) × 16 mm (diameter) : Contact us for more information about other sizes. We offer manufacturing services ranging from small-scale trials to investigational new drugs to help customers optimize formulation design and manufacturing methods. 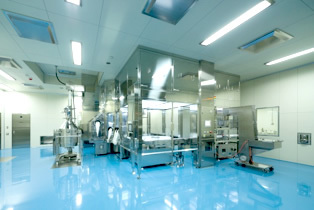 Our facilities are fully equipped with isolators so that we can perform liquid filling and Freeze-Drying in a sterile environment. They can also accommodate single-use systems. *1 Size can be changed. Please contact API for more information. *2 Varies with liquid characteristics and fill quantity. We offer evaluation testing of products under development, analysis method validation, stability testing, and specifications testing for products that we manufacture. Please note that animal testing is outside our capabilities. Please contact us for more information about tests that use living cells. 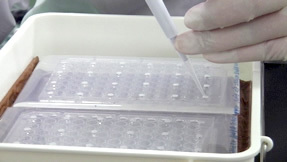 In addition to ordinary laboratory testing equipment such as HPLC and GC systems, we have an LC/MS/MS system (see photo at right), a capillary electrophoresis system (see photo at left), a threshold system, and other equipment needed to carry out specifications testing of protein and antibody pharmaceuticals. We have installed an isolator to control the risk of positive results due to contamination during sterility testing, which is part of the specifications testing regimen for injectable drugs. Our staff has extensive experience in single radial immunodiffusion (SRID) testing.